"Epic metal" redirects here. For epic doom metal, see Doom metal § Epic doom. This article is about the subgenre of heavy metal music. For the Pantera album, see Power Metal (album). For the Metallica demo, see List of Metallica demos § Power Metal demo. Power metal is a subgenre of heavy metal combining characteristics of traditional heavy metal with speed metal, often within symphonic context. Generally, power metal is characterized by a faster, lighter, and more uplifting sound, in contrast with the heaviness and dissonance prevalent for example in extreme metal. Power metal bands usually have anthem-like songs with fantasy-based subject matter and strong choruses, thus creating a theatrical, dramatic and emotionally "powerful" sound. The term was first used in the middle of the 1980s and refers to two different but related styles: the first pioneered and largely practiced in North America with a harder sound similar to speed metal, and a later more widespread and popular style based in Europe (especially Scandinavia, Germany, Greece and Italy), South America (especially Brazil and Argentina) and Japan, with a lighter, more melodic sound and frequent use of keyboards. Anthropologist Sam Dunn traced the origins of power metal back to the late 1970s, when the groundwork for power metal lyrical style was laid down by Ronnie James Dio. The fantasy-oriented lyrics he wrote for Rainbow, concentrated around medieval, renaissance, folk, and science fiction themes, directly influenced modern power metal bands. It is mentioned that songs "Stargazer" and "A Light in the Black", from the 1976 album Rising and 1978's Long Live Rock 'n' Roll, "Kill the King" and "Lady of the Lake", respectively, might be among the earliest examples of power metal. In his 2011 documentary series Metal Evolution, Dunn further explained how Rob Halford of Judas Priest created a blueprint for power metal vocal delivery. His almost constant high-pitched singing became one of the main characteristics of power metal. The twin-guitar sound promoted by duo of K. K. Downing and Glenn Tipton highly influenced this subgenre. Another pioneer in the power metal genre is Jon Mikl Thor, who was a strong inspiration to the American band Manowar. Another British band, Iron Maiden, brought epic and melodic sensibility to metal, creating anthemic, singalong music, an approach widely embraced by modern power metal musicians. The emergence of the early German power metal scene in particular was made possible by Scorpions and Accept. Swedish guitarist Yngwie Malmsteen made a significant impact on many future power metal guitarists, with his accurate and fast neo-classical style. His bandmate Jens Johansson modernized the keyboard sound of Deep Purple's Jon Lord, which was further incorporated into the genre. Manowar's mythological sword and sorcery lyrics influenced a number of power metal bands. In 1987 Helloween released their second album, Keeper of the Seven Keys: Part I, cited by Allmusic as "a landmark recording that remains arguably the single most influential power metal album to date. Its volatile combination of power and melody would inspire an entire generation of metal bands". Kai Hansen of Gamma Ray, ex-Helloween during a show in Barcelona, Spain. Hansen is widely regarded as the "godfather of power metal". Power metal is today associated with fast tempo and melodic harmonies, the sound tempered by characteristics of speed metal, power metal's musical forerunner. Power metal is highly focused on the vocalist, with "clean" vocals being much more prevalent than the growling vocals often associated with extreme metal. Inspired by Ronnie James Dio, Bruce Dickinson, Rob Halford, Geoff Tate, Freddie Mercury and other rock and heavy metal vocalists, power metal vocals are often in a high register, and the singer's vocal range is usually wide. The majority of the genre's vocalists sing in the tenor range and are capable of hitting very high notes, for example Timo Kotipelto of Stratovarius, Tony Kakko of Sonata Arctica, Michael Kiske (ex-Helloween) and Andre Matos (ex-Angra). There are many exceptions who sing in either baritone or bass range. Some vocalists sing in a harsh, thrash metal style, including Chris Boltendahl of Grave Digger, Kai Hansen of Gamma Ray and Peavy Wagner of Rage, or even make use of growls, like Alexi Laiho of Children of Bodom and Wintersun's Jari Mäenpää. Many power metal vocalists, most notably Hansi Kürsch of Blind Guardian, record multi-layered vocals reminiscent of Queen creating a choral effect. Power metal's lyrical themes often focus on fantasy and mythology, camaraderie and hope, personal struggles and emotions, war and death, or combinations of the listed themes. For example, Finnish band Sonata Arctica have been known for focusing their lyrics of their songs on fantasy but also have many songs based on reality, love and relationships. Many Power metal bands based their concept albums on fantasy books and national epics; for example Blind Guardian based their Nightfall in Middle-Earth on The Silmarillion by Tolkien and Kamelot based Epica and The Black Halo on Goethe's Faust. Some bands have even written their own imaginary stories, like Rhapsody of Fire's Emerald Sword Saga and The Dark Secret Saga, Iced Earth's Something Wicked Saga or Avantasia by Edguy's Tobias Sammet. Many otherwise typical metal themes such as religion and politics are comparatively rare but not unheard of. Historical themes have also been used. Sabaton's main lyrical themes focus on historical wars, war battles and individuals of war who are and have been notably recognized in war. Examples include World War I, World War II, Vikings, Samurai, and much more from around the world including the American, Swedish and German militaries. Serenity, an Austrian (symphonic) power metal band, focuses mainly on historical figures and events, including Sir Francis Drake, Marco Polo, Galileo, Beethoven, and Napoleon. A brief sample of a track from Keeper of the Seven Keys Part 1, the second album of Helloween, and one of the first albums to represent the European Power Metal style. Power metal guitarists and bassists generally play rapid streams of notes, but change chords comparatively slowly, with a harmonic tempo of once per measure or slower. Fast and technically demanding guitar solos, however, are almost guaranteed. The slow changing of chords is significant in defining power metal just as the fast rapid chord changes often define traditional thrash metal. Power metal often makes use of Major chord progressions as well as circle progressions. Some of the most influential and acclaimed power metal guitarists are Kai Hansen of Gamma Ray, Michael Weikath of Helloween, and Timo Tolkki formerly of Stratovarius. It is a common trait in power metal for the bass guitar to take a back seat, so to speak; often simply providing the chord root notes and being drowned out by the more prevalent rhythm guitars. However, some power metal bands incorporate bass that is more audible with colorful patterns distinct from the rhythm guitars, such as Helloween, Hibria, and Symphony X. Many power metal drummers play double bass patterns with either two bass drums, or utilize a double bass pedal; using them to play a constant stream of sixteenth notes (semiquavers) with snare drum accents on the beat, a style not restricted to, but most often associated with, power metal. The style was used by drummer Ingo Schwichtenberg of Helloween, setting a blueprint for many other drummers to follow. Others, such as the drummers of Blind Guardian and Iced Earth, use a more thrash metal style of drumming with rapid bursts of double bass that involve three to six beats with the double kick. 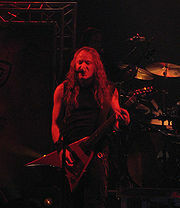 Power metal bands often incorporate keyboards into their musical arrangements, something popularized by Jens Johansson of Stratovarius, though their usage varies from subtle accents to a full-blown melody line. Some power metal bands also record with symphonic elements, and as such, they utilize a full orchestra to fill the role usually played by the keyboardist. Music sample of Jag Panzer's "Harder than Steel" from their 1985 album Ample Destruction, an early example of USPM. This branch of power metal emerged in early 1980s in the United States, drawing its influences mainly from traditional metal and the NWOBHM. Though very close to its roots, US power metal (often abbreviated USPM) is often faster and more energetic than traditional heavy metal, with a more riff-driven approach than its later European counterpart and with a relative lack of keyboards, but more melodic and often with a higher emphasis on guitar leads than thrash metal. USPM is also notable for its wide (but not universal) use of high-register operatic vocals, a trend which would continue with the rise of European power metal in the late 1980s and early 1990s. This style is not exclusive to North America, as European bands such as Sacred Steel, Majesty, and Australian band Pegazus later adopted a style inspired by USPM bands in the 1990s. The early releases of progressive metal bands Queensrÿche and Fates Warning, such as The Warning (1984) and The Spectre Within (1985), heavily influenced a number of bands that were to develop a common sound towards the late 1980s. Among the better known representatives of the style, such as Manowar, Vicious Rumors, Virgin Steele, Riot or Jag Panzer, a small number of bands enriched their sound with progressive and epic elements; the most obvious examples being Crimson Glory, Savatage, Sanctuary and the epic doom metal band Cirith Ungol. US power metal saw a sharp decline in popularity at the beginning of the 1990s, though the style has rebounded somewhat in the past decade, with bands such as Liege Lord or Heir Apparent reforming for live performances and some, like Helstar, Artizan, Omen and Manilla Road, releasing new material. A brief sample of the sixth track from Sonic Firestorm, the second album of DragonForce. European power metal originated from speed metal and the NWOBHM, emerging in late 1980s, particularly in Germany, with Helloween, Running Wild, Rage, Grave Digger and Blind Guardian, followed by Finland's Stratovarius in late 1980s and the early 1990s. These bands pioneered the genre, but took it in somewhat different directions. Helloween, followed by early Gamma Ray, mixed fast palm muted speed metal riffs with high-pitched clean vocals, and with a strong focus on melody and uplifting, positive themes. Stratovarius further developed this melodic direction by making heavy use of keyboards, with lyrics dealing with emotions and personal issues. Blind Guardian utilized the technique of vocal and guitar overdubbing to create an epic atmosphere, with lyrical content strongly based on fantasy novels, myths and legends. The symphonic and neo-classical elements also found their way through power metal with bands like Rhapsody of Fire, Serenity and Nightwish. HammerFall simplified their power metal to bring it closer to traditional heavy metal. This genre spread over Europe, often incorporating further influences from progressive and folk music. Italy's Elvenking, Sweden's Falconer and Denmark's Wuthering Heights are in particular influenced by folk music, while Angra, Kamelot, and especially Symphony X (though none of these 3 are European) are known for combining progressive and power metal. Furthermore, some bands are known for combining power metal with more aggressive musical forms, such as Children of Bodom, who combined elements of power and melodic death metal, or Iced Earth, who combined power and thrash metal. Two Helloween albums, Keeper of the Seven Keys: Part I (1987) and Part II (1988) are usually considered the first proper European power metal albums. European style power metal became widespread in comparison with US style as of the mid 1990s, with numerous North American bands such as Theocracy, Borealis, Forgotten Tales, Avian, Pharaoh, Nevermore, Circle II Circle, and Kamelot demonstrating the style. This European style of power metal is sometimes considered the "second wave" of power metal since its origination was in the late 1980s rather than the mid 1980s, and the widespread influence and development of the genre that came in its tow while US "first wave" style markedly declined. ^ Sharpe-Young, Garry (2003). A–Z of Power Metal. Rockdetector Series. Cherry Red Books. ISBN 978-1-901447-13-2. "Riffs became labyrinthine, vocals scorched higher altitudes—and they even managed to crank out some more volume." ^ Sharpe-Young, Garry (2003). A–Z of Power Metal. Rockdetector Series. Cherry Red Books. ISBN 978-1-901447-13-2. "American metal such as Queensrÿche, Attacker, Jag Panzer, Iced Earth, Liege Lord, and Savatage; European bands such as Helloween, Gamma Ray, Blind Guardian, Running Wild, and Grave Digger;"
^ Dunn, Sam. "Metal Evolution, Episode 110: Power metal". VH1. Retrieved 2012-07-02. ^ Stagno, Mike. "Hatebreeder review". Sputnikmusic. Retrieved 2011-10-13. ^ Stagno, Mike. "Wintersun review". Sputnik Music. Retrieved 2012-01-04. ^ a b Sharpe-Young, Garry (2003). A–Z of Power Metal. Rockdetector Series. Cherry Red Books. ISBN 978-1-901447-13-2. ^ Wang, Albert. "Albert's Beginner's Guide to Symphonic Metal". Retrieved 2 November 2016. Sharpe-Young, Garry (2003). A–Z of Power Metal. Rockdetector Series. Cherry Red Books. p. 464. ISBN 978-1-901447-13-2. Dio, Ronnie James; Bukszpan, Daniel (2003). The Encyclopedia of Heavy Metal. Barnes & Noble Publishing. p. 300. ISBN 0-7607-4218-9. Kahn-Harris, Keith (2007). Extreme metal: music and culture on the edge. Rockdetector Series. Berg Publishers. p. 194. ISBN 1-84520-399-2.